The SAE Flareless (aka. "bite type") tube fitting is a three-piece system (nut, ferrule, and body) that works by forcing the ferrule cutting edge into the tubing wall to create a seal. The resulting spring-action joint offers a leak proof seal and resistance to vibration. Flareless fittings do not require a flaring operation and are used on medium to heavy walled tubing. Standard material for the fitting body is Type 316 stainless steel for the body and nut, and Carpenter Custom 630 (17Cr - 4Ni) stainless steel for the ferrule. The ferrule is slightly discolored because it has been heat treated to give extra hardness for biting. The ferrule must be harder than the tubing to form the bite that seals the assembly. The finish on SAE flareless fitting nuts is a dark graphite color due to lubricant coating. The fitting nut has a bonded dry film lubricant which aids in the installation process to reduce torque and prevent galling. 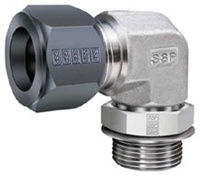 The SAE flareless tube fitting is an excellent fitting system for higher vibration hydraulic systems where a user does not wish to flare tubing. On dynamic hydraulic systems, the SAE flareless tube fitting is recommended over other flareless tube fitting systems, specifically compression, or "instrumentation." The design of the SAE flareless single biting ferrule holds the key to this superiority. The ferrule bows during assembly and "bites" into the tubing wall. The spring-action joint provides superior shock absorption and holding power. In addition, the bite and other visual cues, allow a user to inspect the assembly prior to system pressurization. With other flareless tube fitting systems, a user must rely on indirect verification of a positive seal through the use of gap gauges or by counting the number of hex flats torqued from a finger-tight position. Like all metal-to-metal tube fitting systems, the SAE flareless is limited in the number of disassemblies and reassemblies the tubing can withstand as the ferrule bites deeper and deeper into the tubing wall with each reassembly. SSP strongly discourages the intermixing of components from different manufacturers.